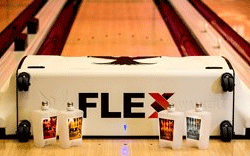 With the motto, "your lanes our passion," Kegel has been dedicated to the bowling business for 32 years. 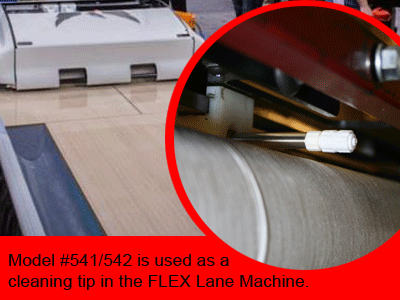 To further their mission of enhancing the sport of bowling, the company recently teamed up with Smart Products to accurately control the flow of lane cleaner for their new FLEX machine. Unveiled at the International Bowl Expo, FLEX is Kegel's most sophisticated and technologically advanced lane machine. When designing FLEX, a goal of Kegel's research team was to accurately dispense cleaner and eliminate drips from the tip when it moves back and forth across lanes. Additionally, Kegel wanted to eliminate any drips from the cleaner when the machine is traveling on the approach, which is very important for liability. Per feedback from Kegel, Smart Products' Model #541/542 has proven to be a very effective solution. This valve is used as a cleaner tip for the FLEX machine, and it meets Kegel's design requirements with its ability to withstand certain harsh chemicals found in lane cleaners, as well as prevent any unwanted drips. "Cleaners can damage plastics and make them brittle and prone to cracking, so the Smart Products design is performing well in our application. The design elements work well since some cleaner concentrates are applied in strong ratios to clean heavy conditioner off the lane. It is also imperative that cleaner does not drip on the approach as the machine moves from one lane to the next, and the valve has been performing well here too," says Kegel's CFO Larry Klemme. The unique tamper-resistant design of our Series 500 Miniature Check Valves proved to be an ideal solution for Kegel's FLEX Lane machine. The ability to mix and match #541 Female Luer Lock with #542 Male Luer fit perfectly with their existing design. And, like all of our customers, Kegel was able to further customize their valve by plastic body material, o-ring, and opening spring pressure to ensure its ability to meet their application's needs. Recognized as the leading experts in lane maintenance, Kegel is the official partner for all major governing bodies of bowling – ABF, ETBF, PABCON, USBC, and WTBA. For more information, visit www.kegel.net.